Shop our large collection of economy velvet ring displays for your elegant store! Find the best velvet pieces, from ring trays, stands, boards & pillows to pads & foam inserts. 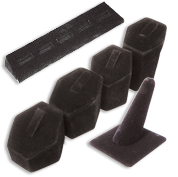 From black velvet or travel cases to ring finger displays, we've got you covered! Pieces made of faux economy velvet, all at discount prices thanks to our wholesale deals.